Get inspiration-packed info to help you identify + amplify your introvert strengths. Usually twice a month, sometimes less, never more. When you join us, you receive not only the great content listed below… you’ll also get access to my free crowdsourced ebook, “I is for Introvert: The A-Z Guide to the Quieter Side” (scroll down for more details). There’s the basic answer, based in psychology and physiology: introverts gain energy from solitude, drain energy during social interaction, and relate to the world from the inside, out. But that’s not the whole story. Being an introvert is practically a lifestyle. Because of that internal orientation, and because we relish our alone-time to an almost pathological degree, we make choices that aren’t always understood by those around us. We can certainly be social, popular, vocal, and outgoing. And in order to be all of those things and not go insane, we must – MUST – make it a priority to honor our introvert needs. What does “honoring our introvert needs” look like? Ask 100 different introverts, and you’ll get 100 different answers. So that’s what I did. I posed the following question to The Introvert Entrepreneur Facebook Community: Using the “I is for Introvert” framework, what words describe the ups, downs, pleasures and pains of being an introvert? 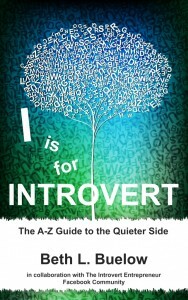 Close to 150 people offered their insights to the “quieter side,” and those are included in Part I of “I is for Introvert.” Some contributions are funny, creative, or celebratory, others profound, poetic, or highly personal. And there are some that express the frustration of feeling misunderstood, or being perceived as broken or less-than. Each and every voice adds another piece of information that helps us all embrace the introvert among and within us. Part II includes eight of the most popular posts on TheIntrovertEntrepreneur.com. Their focus ranges from coping with envy and broken friendships, to exploring the next iterations of the introvert/extrovert conversation and what it means to be a “happy” introvert. Are the words, ideas, and experiences offered here the exclusive domain of introverts? No. Will everything in here resonate with everyone? Most definitely not. Yet, these are the individual thoughts that came forward from the community, and these are the thoughts this book celebrates.